A rather quick monochrome card for you today. I have used the "Three Tree's" Stencil and used only one to create the topper. All products used can be found on the Imagination Crafts website. I have taken a piece of Silver mirri card and matted onto a 6 x 6 square card. 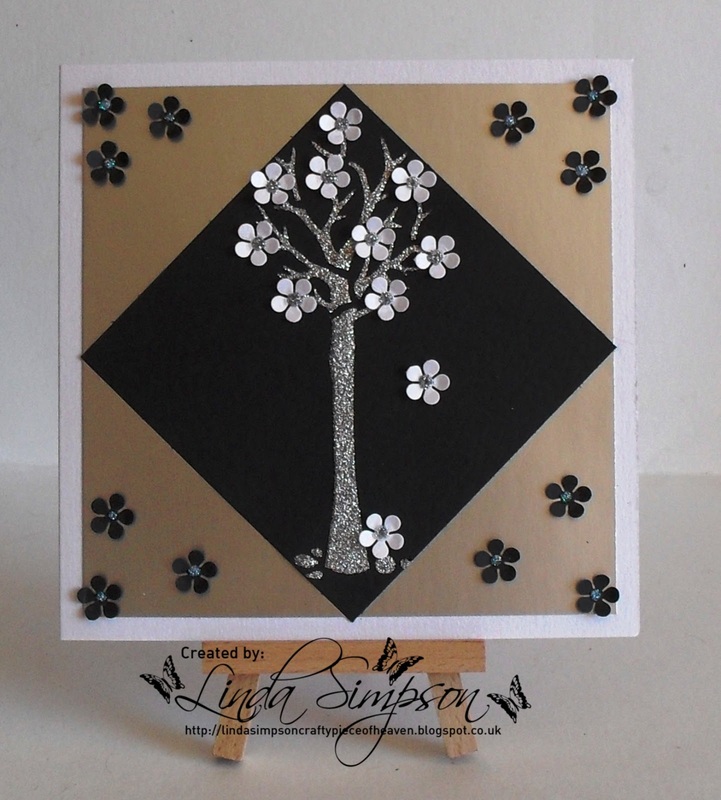 I stenciled the tree using Sparkle Medium Silver onto black card. 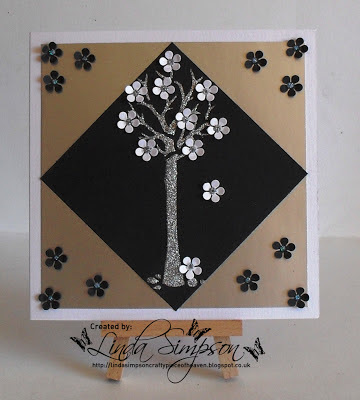 I have punched out blossoms in black and white and arranged them on the tree, added Sparkle Medium to the centres of the flowers and there you have it a quick and easy but striking card. A little reminder that our first challenge starts on 1st July 2013 and we are looking forward to seeing some of your own creations using our products. 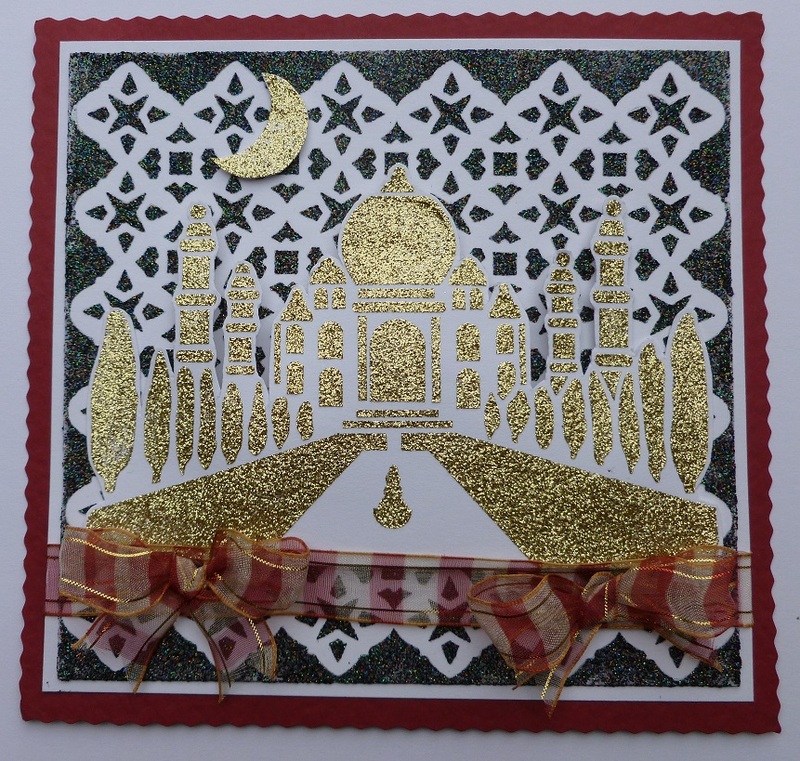 The card I am showcasing today I have called "Taj Mahal by Moonlight"
The base card is made from Red Card stock and trimmed with a trimmer. Onto this I have matted some white card leaving a border of red showing. Taking another piece of white card and laying the Mini Marakesh stencil on top I then spread the Black Stars Sparkle Medium over the stencil with the spatula. I then removed the stencil and left to dry. Once it was dry I matted this onto the base card leaving a small white border showing. 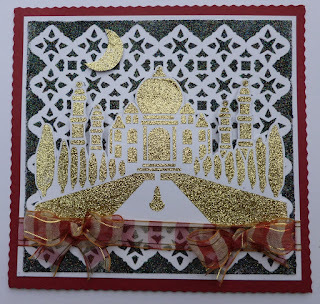 Taking a further piece of white card I laid the Taj Mahal stencil on top and spread the Gold Shine Sparkle Medium over the design. Once this was dry I trimmed around the design and fixed it to the Mini Marakesh background using sticky foam pads. I then fixed some ribbon across the front of the card near the bottom and added two bows. That is all there is to it friends, like I have mentioned to you before, if you can spread butter on your toast you can spread Sparkle Medium on your cards. LOL! If you are not sure how to use Sparkle Medium, to to the Imagination Crafts Website where Sue has a couple of videos showing you just how easy it really is.